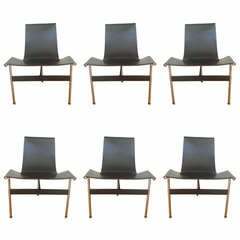 This T Lounge Chair ‘3LC’ by Katavolos, Littell, & Kelley for Laverne International is no longer available. 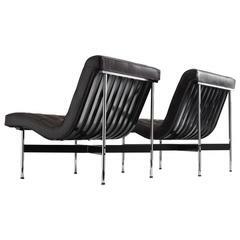 T Lounge Chair by Katavolos, Littell, & Kelley for Laverne International, United Stated, 1952. In 1952, William Katavolos designed, together with Douglas Kelley & Ross Littell, the iconic sling-back T chair as model 3LC in Laverne International's sculptural New Furniture series. With hidden screws, the leather seat is attached to a frame of chromed tubular steel and black-lacquered flat steel to create a striking three-legged chair. The steel frame creates an open look an floating appearance of the seating. The T Chair can be found in the permanent collections of the Museum of Modern Art in New York and other top museums worldwide. 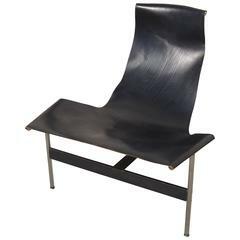 This rare lounge version of the chair retains its original black leather, which is beautifully patina. This chair holds the middle between functionalism and ornate design. In 1952 William Katavolos, Douglas Kelley and Ross Littell, graduates of the Pratt Institute in New York embarked on a six year collaboration in designing textiles, dinnerware and furniture at Laverne which was established in 1938. One of their most popular designs was this side chair. One chair is in the permanent collection at the Museum of Modern Art in New York.